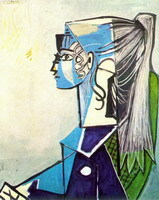 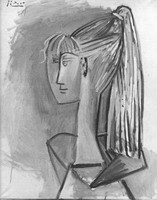 Sylvette David, known as The Girl with a Ponytail, Picasso’s 50s muse was embodied in more than 40 paintings, drawings and sculptures. 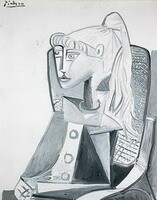 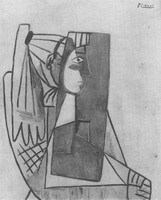 In October 1954, during the exhibition of Picasso’s works in Paris, Mary Dunbar wrote in Sunday Times: “About 20 different pictures which he painted last spring of a 19-year-old girl in Vallauris are shown. 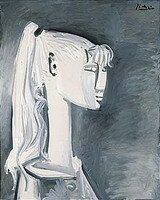 Her long, fair hair, tied back in a 'horse's tail' is a predominant feature in all of them and already I saw many girls”. 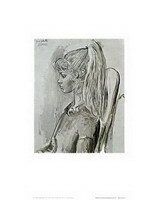 Brigitte Bardot adopted the same hairstyle, presumably after seeing the coverage of Sylvette in Paris Match. 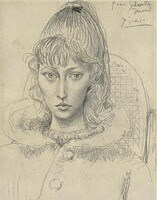 Sylvette was born on November 14, 1934 in Boulogne-sur-Mer. 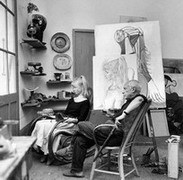 Her father studied art and had a gallery in Paris, so the girl was brought up in a bohemian environment of artists and people close to the art world. 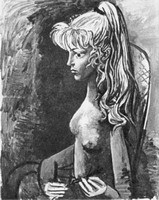 During the war, she and her mother lived in the naturist community on the Isle du Levant. 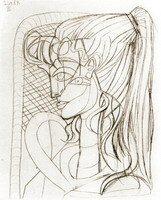 In 1954, she lived in Vallauris with her mother and her fiancé, the English sculptor and designer Toby Jellinek. 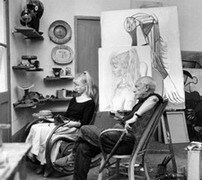 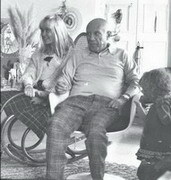 “ We met Picasso at an exhibition and he bought one of Toby's chairs, which we delivered to his studio the next day. 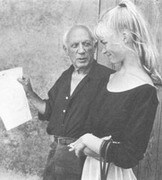 When we arrived he showed me my portrait painted with charcoal and asked me to pose”, recalls Sylvette. 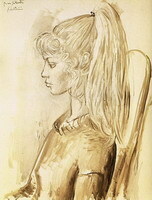 “ My father said I should wear my hair like a ballet dancer he'd seen, swept up behind into a high ponytail. 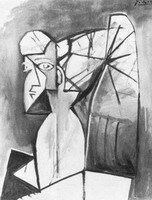 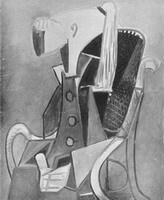 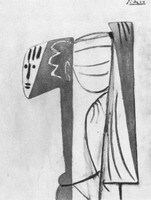 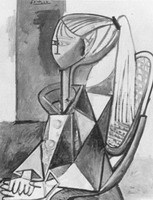 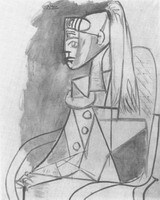 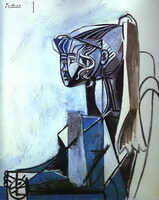 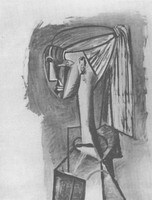 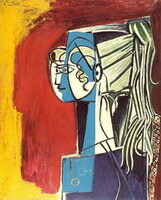 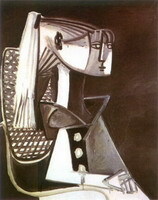 Picasso was charmed when first he saw it: as some of his pictures suggest, he looked upon it as a sort of helmet, like those of ancient times”. 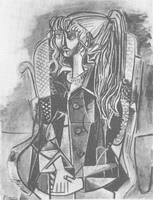 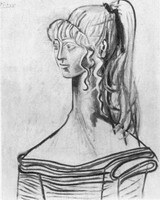 As a result of such cooperation, Picasso drew around 40 images of her, a number of which starred in his Paris exhibition that year. 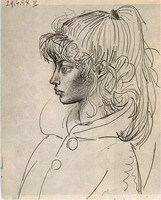 May 5, 1954 Sylvette woke up famous; people on the streets of Vallauris began asking her for autographs. 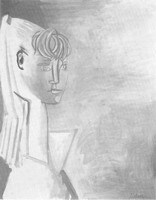 Sylvette's inheritance from the experience included a painting, which was sold to pay for Toby's treatment. 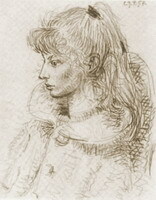 In 1970 she got married the second time and took her husband’s surname Corbett; she used a different first name, too - Lydia. 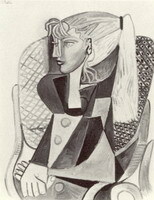 She has three children: Isabelle, Alice and Lawrence, and seven grandchildren, all of whom live with her in western France. 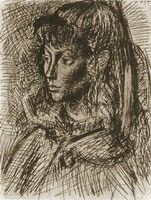 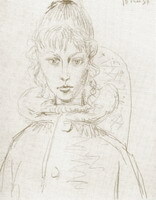 She is a rather successful artist and her works are exhibited in Britain, France and other countries.